Anything Goes is Anything Goes no matter who produces it, right? Well, maybe not. New Line Theatre, known for its productions of edgier and lesser known shows, has taken this classic, “fun” show and given it a presentation that’s in several ways different than what’s come to be expected as usual. There’s an emphasis on satire and less of an emphasis on dance than other productions I’ve seen, but still, it’s Anything Goes, and the overall effect is energetic, smart, and very very funny. This is a version of the show I haven’t seen on stage before. 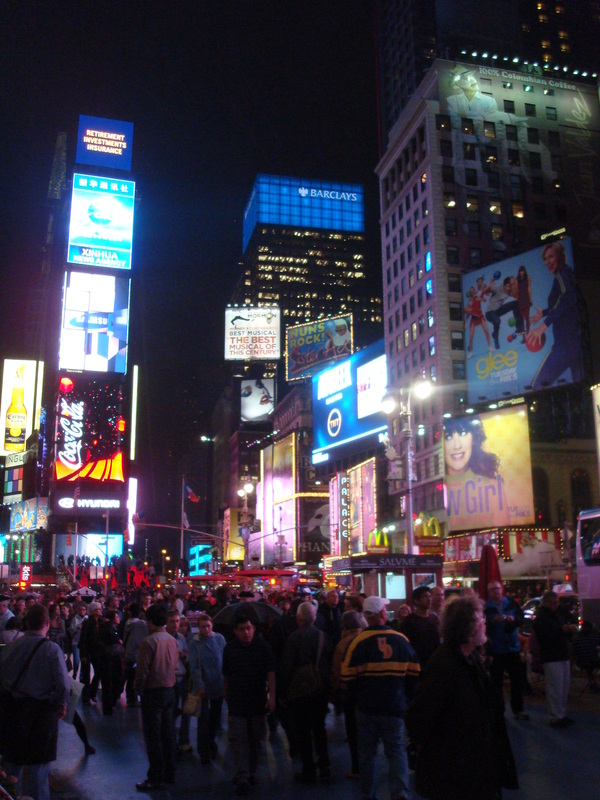 Most more recent regional productions, and also the 2011 Broadway revival, have been based on the 1987 revival script of the show. For this production, directors Scott Miller and Mike Dowdy-Windsor are using the 1962 script of the show, which has the same basic characters and plot as the later revival, but with some differences in specifics and in the songs featured, and also in the prominence of some characters. While evangelist-turned-nightclub singer Reno Sweeney (Sarah Porter) is still a major focus, as is Billy Crocker (Evan Fornachon), the overworked stockbroker in love with young debutante Hope Harcourt (Eileen Engel), and “Public Enemy #13” Moonface Martin (Aaron Allen), but that focus is shifted a little, and through a combination of the different script and New Line’s intuitive directing, we get to see a somewhat different look at these characters, as well as others such as Hope’s seemingly stuffy English fiance, Sir Evelyn Oakleigh (Zachary Allen Farmer), and Moonface’s partner-in-crime, the brash, flirtatious Bonnie (Sarah Gene Dowling), who was renamed “Erma” in the 1987 version. The focus on dance isn’t quite a prominent here either, but what’s there is still spectacular, along with the ever-present broad, sketch-style comedy, which is perhaps even apparent so than in the other version. Here at New Line, what we get to see is a sharp, witty, tuneful, and well-cast production that’s a delight from start to finish. New Line artistic director and Anything Goes co-director Scott Miller mentions in his director’s notes in the program the timeliness of this show. Many of the themes, he notes, are just as prominent today as they were in the 1930s, when this show was orginally written, and the time period in which it sill takes place. The show at New Line isn’t as big as other productions I’ve seen, but, especially in terms of costumes (designed by Colene Fornachon and Sarah Porter), it’s as glam and glitzy as anyone would expect. With the sumptuous evening gowns, dapper suits, and varous nautical and gangster attire, the spirit of the 1930s has been brought to the stage well. Rob Lippert’s excellent unit set, representing the luxury ocean liner on which the action takes place, is also on point, as is his equally effective lighting. There’s also great work from the excellent New Line band, doing justice to the marvelous Cole Porter score and outfitted in sailor hats in accordance with the theme of the show, ably led by Music Director and “captain” Nicolas Valdez. The cast here is a treat, led by the always excellent Porter as the brassy, bold, and also surprisingly vulnerable Reno Sweeney, with standout moments such as the solo “I Get a Kick Out of You”, production numbers “Anything Goes” and “Bow, Gabriel, Blow”, and a fun bit of harmonizing with co-stars Fornachon and Allen in “Friendship”. Her scenes with the wonderful Farmer as the initially jaded, bewildered, and ultimately endearing Sir Evelyn are especially engaging. There’s also top-notch work from Dowling in a scene-stealing performance as Bonnie, and from Allen in an impressive comic term as Moonface, the small-time crook who wishes he were big-time. Fornachon and Engel make a good pair as Billy and Hope, as well, with great duets on “It’s De-Lovely” and “All Through the Night”. Reno is well-supported by her “Angels” Purity (Michelle Sauer), Chastity (Larissa White), Charity (Alyssa Wolf), and Virtue (Sara Rae Womack), and there are also hilarious supporting performances from Kimmie Kidd-Booker as Hope’s mother, Evangeline Harcourt, and Jeffrey M. Wright as Billy’s on-again, off-again boss, Elisha J. Whitney. There’s also a strong ensemble in support. The usually excellent New Line singing is there, of course, joined by impressive, energetic dancing as well. This is a slightly different Anything Goes than you may be used to, but that’s a good thing. It’s a fresh look at an older show, with a bright, memorable score of hits by a legendary composer, as well as delightful moments of broad comedy and some pointed satirical touches. And the cast is great, as well. It might not be the type of show one might expect from New Line, but the level of excellence is certainly on par with New Line’s best. It’s refreshing, bold, and lots of fun. 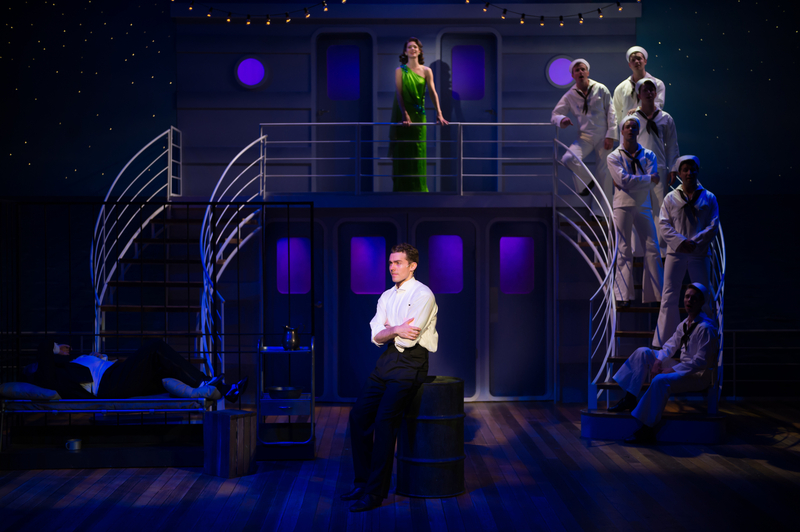 New Line Theatre is presenting Anything Goes at the Marcelle Theatre until March 24, 2018. In a way, Anything Goes could well be called one of the orginal “jukebox musicals”. It’s been performed in various versions for decades, with many lyric, song, and book changes, and the plot, while entertaining, is fairly slight. The show exists, essentially, to be a showcase for the songs of celebrated 20th Century composer and lyricist Cole Porter. It’s a lively show with lots of silly comedy and spectacular dancing, and it’s currently being performed in top-notch fashion at STAGES St. Louis. The story is somewhat silly, but entertaining nonetheless. It follows nightclub singer Reno Sweeney (Julie Cardia) and friends on an ocean liner traveling between New York and London in the 1930s. Reno’s got something of a crush on her old friend, the handsome stockbroker Billy Crocker (Brent Michael DiRoma), but Billy’s newly smitten with young debutante Hope Harcourt (Heidi Giberson), who is sailing on the cruise with her mother (Kari Ely) with the aim of marrying rich English nobleman Lord Evelyn Oakleigh (Dan Fenaughty). Meanwhile, gangster Moonface Martin (Bob Amaral), “Public Enemy #13”, is on the run from the law, and boards the ship in preacher’s disguise, bringing his friend Erma (Laura E. Taylor) along. What ensues is a comedy of love triangles and quadrangles, as well as mistaken identity, gambling, singing and a whole lot of dancing. The plot isn’t really one that bears a lot of scrutiny. It’s really just a platform for the songs and some some hilariously goofy comedy. Despite the various script updates over the years, the show does still come across as slightly dated, and there are some unfortunate stereotypes that are played for laughs. Still, for the most part it’s a fun show, and the real focus is on those lovely Cole Porter songs and Stephen Bourneuf’s spectacular choreography and excellent ensemble dancing. This is a very ensemble-dependent show, considering all the stylish dance-numbers and intricately performed choreography. The ensemble sparkles on on numbers like the tap-dance heavy “Anything Goes” and the truly showstopping “Blow, Gabriel, Blow” led by the big-voiced Cardia as Reno. Cardia also displays a strong sense of comedy, working well opposite both the charming DiRoma as Billy, the hilariously shady Amaral as Mooonface, and the delightfully goofy and thoroughly winning Fenaughty as Lord Evelyn. All of these performers show great comedy skills and excellent voices, especially DiRoma, who also shares delightful chemistry with Giberson, who is also in excellent voice as Hope. There are also fun comic performances from the always excellent Reichert as Billy’s nearsighted boss Elisha Whitney, and Kari Ely as Hope’s mother, socialite Evangeline Harcourt. Flack as the Captain, Brennan Caldwell as the Ship’s Purser, and Taylor as Erma also give memorable performances. It’s a very strong cast, from the leads to the ensemble, working together to bring life to the classic Porter score and a great deal of laughs to the audience. The set, designed by James Wolk, is striking, colorful and versatile, creating a vibrant 1930’s atmosphere. There are also some marvelously detailed and stylish costumes by Brad Musgrove. Sean M. Savoie’s lighting is effective and atmospheric, as well. Ultimately, the point of Anything Goes is to entertain, and the production at STAGES does that well. It’s a big, bold, stylish and energetic production that splendidly showcases the marvelous score and choreography. It’s also hilariously funny, with a decidedly silly sense of humor. Despite a few drawbacks in the script, this is about as ideal a production of this show as I can imagine. 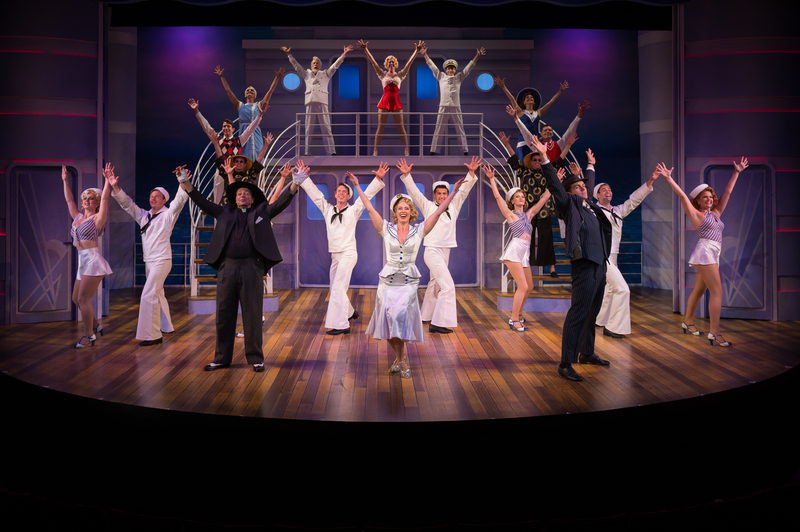 STAGES St. Louis’s production of Anything Goes is running at the Robert G. Reim Theatre in Kirkwood until August 16th, 2015. When I was a teenager back in the 1980s, my Mom would occasionally take the family to a show at a local dinner theatre. I still remember the one time when our waiter informed us that he would be playing Curly in that evening’s performance of Oklahoma! Actors doubled as waiters at this particular dinner theatre. Our waiter, whose name was Kevin, was not the principal Curly—he was the understudy. Kevin was young, possibly only a year or two out of college. He was good-looking and very personable, and we hadn’t heard of the actor who was supposed to play Curly anyway, so we had no objections whatsoever. When the show started, my family was cheering for Kevin, and he turned out to be a wonderful Curly. His youth actually added to the characterization, and I was happy to see this young actor get a chance to show what he could do. I wasn’t disappointed in the least that I hadn’t seen the main actor. Now, of course this was a dinner theatre and not Broadway or the West End, but that experience stayed with me over the years to the point where I have come to truly respect and appreciate understudies, and I have seen some great ones since that I have never regretted seeing instead of the billed actors. I’m writing this post as a direct reaction to a conversation I saw on Twitter yesterday. Tam Mutu (@tammutu), a wonderful actor and singer who is currently playing Javert in Les Miserables in the West End, asked a series of questions about theatregoers’ opinions of understudies and received a variety of responses. I did respond to one of his questions, but because it was Twitter and limited to 140 characters, I think my response was inadequate. I also looked at a lot of the responses and saw the whole dialogue that developed, and I thought this would be a subject worth writing about. I’m not going to go over all the Twitter responses, but I’m going to respond to some of Mr. Mutu’s questions individually and also try to explore the whole idea of understudies and why I think they are so worthy of respect. Tam Mutu’s first question was (to paraphrase) “would you rather see a show with an ill principal actor or a healthy understudy?” To this question, my answer is easy—a healthy understudy. This is for the sake of both the principal and the understudy, because if a performer is ill, he or she should be resting. Singing through a cold can damage the vocal cords, and it’s much better if a performer sits out a few performances rather than hurting his or her voice in the long run. Also, understudies are trained performers who work hard and are just as dedicated as the principals. Some understudies have even been given their big breaks because they went on for the scheduled star on particular night, and a producer happened to be in the audience to see that understudy give an amazing performance. Shirley MacLaine in The Pajama Game on Broadway is a famous example. Now, the word “star” brings up another issue for me. I often wonder if the reason a lot of people get disappointed when the understudy is on is that there is a perception that they are somehow getting “second best” because the understudy isn’t as well-known. I don’t think in terms of “stars” when I see shows generally, unless it’s a legend like Bernadette Peters or Michael Crawford, but the fact is that even legendary veterans like these are human beings and they can get ill. It’s much better for them if they take a little bit of time off and get healthy, and in the meantime, the audience potentially gets a real treat, like when I saw Anything Goes on Broadway and both “star” performers—Sutton Foster and Joel Grey—were off. That allowed me to discover two wonderful performers in Tari Kelly and Robert Creighton, and I did not for one minute feel like I was getting “second best”. In fact, when Tari Kelly came to St. Louis to star in the Muny’s production of Thoroughly Modern Millie, I was excited because I had already seen her on Broadway and knew what a great performer she was. This also brings me to another question Tam Mutu asked on Twitter, which was about what a person would do if they went to see their favorite performer in a show and they were off. That’s about the only time when I would possibly be tempted to exchange my tickets, especially if I had traveled a very long way to see a particular performer (as I have done a few times). I might postpone a special trip if it involves flying, but if that’s not possible or if I were already there I would most likely see the show. I have never exchanged my tickets because an understudy was on and probably wouldn’t in that case either, because I would want to see the show and the rest of the cast, but I can’t say the thought wouldn’t cross my mind. I do think that after seeing the show with the understudy, if it’s possible I would try to see it again later in the week (depending on how long I was in that city) if the favored performer was back in. I don’t blame other people for exchanging their tickets, though, especially if they can’t afford to see the show twice. It’s not about seeing “the star” in that case. It’s about seeing someone you really admire as a performer (whether they’re famous or not) and made an extra effort to see, and it’s understandably a letdown if you get there and find out the understudy is on, no matter how great the understudy is. Even though I probably would still see the show, my response to Mr. Mutu when he asked if people would change their tickets if they knew in advance that a performer would be off was basically “it depends on who it is”, and that is why. There is no disrespect whatsoever intended toward the very hardworking understudies or the performers who take time off for much-needed recovery from illness. In addition to favorite performers, sometimes there’s just a performance that is so talked-about that you really want to see it, and so when there’s an understudy on, the disappointment is understandable. I wouldn’t change my tickets in that case either, though, because that has happened to me. When the Next to Normal tour came to St. Louis, starring the Tony-winning Alice Ripley as Diana, I have to admit I was disappointed when I looked at the cast board upon arriving at the theatre and saw that Ripley was off. Once I sat down and watched the show I was very glad I got the chance to see her standby, Pearl Sun, give an outstanding performance. I did get an opportunity for discount tickets to see the show again, so I bought them in hopes of seeing Ripley, and when I did I was glad I had seen both performers because they each brought something different to the role. I also saw Jason Watson, the standby for the role of Dan, the first time I saw the show, and thought he was wonderful as well. It was a great experience to get to see the show twice with different leads each time. I understand that some people won’t be able to do that, but I was happy that I did. I guess the point of all of this is to say that talented performers are everywhere, and just because someone isn’t a “star” or a household name doesn’t mean they’re not a fantastic performer and possibly (like Shirley MacLaine and others) a future star. Also, when you get to a show and find that the understudy is on, while I do understand being disappointed if the principal was someone you really wanted to see, please try not to think you’re getting “second best”. The understudy just may surprise you. Also, it helps to remember that actors are not super-human and that they do get ill occasionally. It’s understandable to be disappointed, but please don’t blame them when they need to take a few days off. Thanks to Tam Mutu for asking such thought-provoking questions and I really look forward to seeing him as Javert when I see the show in October. If unfortunately he is off, though, I’m sure his understudy will be great as well. Thanks also to all the wonderful understudies I have seen over the years, starting with Kevin at that dinner theatre years ago. Great talent is great talent, whether the performer is a “star” or not, and these unsung heroes have proven that year after year. The chance to see this show was kind of a dream come true for me, since I’ve been a fan of Stephen Sondheim and Bernadette Peters since I was a teenager. It was also great to be able to see London theatre legend Elaine Paige on stage as well, along with a top-notch cast of Broadway veterans. This was a classic Sondheim show with star-studded cast, and the production did not disappoint. The mood is set the minute you walk in the door, as the relatively new Marquis Theatre has been transformed by set designer Derek McLane into a crumbling old variety house years past its prime and ready for demolition, with a worn-out stage and black and gray sheets draped everywhere. The “ghosts” of elaborately dressed showgirls haunt the space, wandering in and out of scenes and standing about on the various levels of scaffolding backing the stage. It’s the story of a reunion of participants (mostly showgirls) from a Ziegfeld-like variety revue called the Weissmann Follies, which supposedly ran in this old theatre every year between the World Wars. Here the former Follies girls update each other on how they have been and remember their glory days as young performers. Some of the women seem to have few regrets and others have many, but for the central characters Sally (Peters) and Phyllis (Jan Maxwell), and their husbands Buddy (Danny Burstein) and Ben (Ron Raines), regret is still a major part of their lives, as played out in the events of the show as they revisit and recall their earlier selves, culminating in a Follies-styled “Loveland” fantasy sequence, where they portray the follies of their own lives, showbiz-style. I don’t want to write a novel about this production, so I’ll have to condense my thoughts and just say it was wonderful. The leads were universally well-cast, and the contrast between Peters’ depressed, delusional Sally and Maxwell’s bitter, sarcastic and cynical Phyllis was striking. Both gave wonderful performances, but to my mind, Maxwell was the star of the show, giving a truly multi-layered performance. Her numbers “Could I Leave You?”, simmering with caustic wit, and “The Story of Lucy and Jessie”, in which she portrays her struggle between the younger and older versions of herself, were true highlights of the production. She was also very well matched by Raines as the self-absorbed, self-destructing Ben. Peters had a great moment with “Losing My Mind”, as well, perfectly portraying Sally’s obsessive love for another woman’s husband. Peters is such a master of Sondheim’s material that all she has to do is stand onstage and sing, portraying the full emotional range of the song and holding the audience riveted. Danny Burstein as the charming but conflicted Buddy also had some great moments, and together these four formed the center of the production. 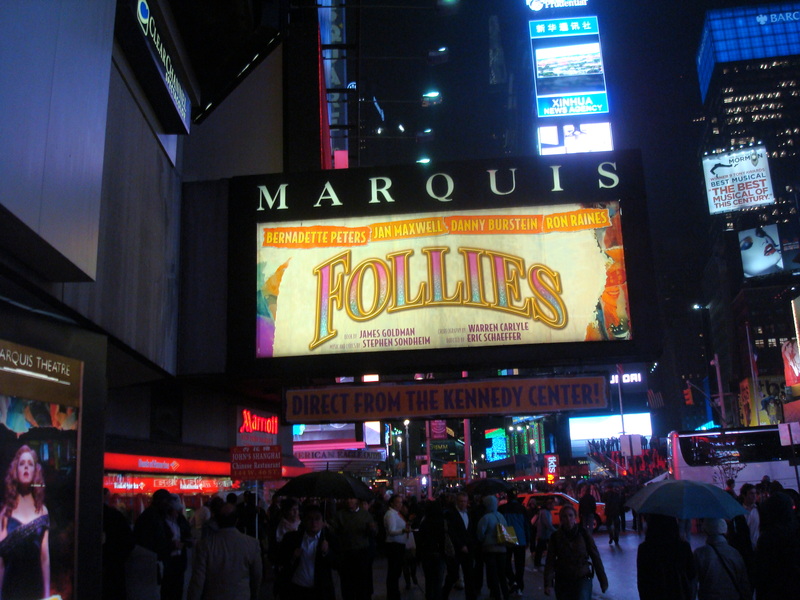 Another strength to Follies, though, is that its structure gives many performers their moments to shine as the other former Follies girls tell their stories and remember their Follies performances. Highlights from this production were Jane Houdyshell’s brassy “Broadway Baby” and Terri White leading the ensemble in a dance number with their younger counterparts in “Who’s That Woman”—a true show-stopping moment. Paige’s gutsy ode to the ups-and-downs of a career in showbusiness, “I’m Still Here” was also a showstopper. Also, veteran opera singer Rosalind Elias has a great, poignant duet with Leah Horowitz (as Elias’s younger self) on “One More Kiss”. I could list more great moments, but I would just end up listing the entire song list, as the universally excellent cast delivered a strong production from start to finish. The sets and costumes (costumes designed by Gregg Barnes) were elaborately done and helped to set the conflicting moods of showbiz energy and underlying darkness, and the “Loveland” sequence in the second act was a bright, fluffy (yes, fluffy) contrast to the dreary, dilapidated theatre setting of the rest of the show. This production was truly marvelous from the performances to the look and and the feel for time and place. I felt privileged to witness it. For a lot of people, this production is simply thought of as “that show with the guy from Harry Potter”, but it’s really a whole lot more than that. Sure, Daniel Radcliffe is front-and-center in the advertising–and he’s great in a very un-Potterlike performance–but no one performer can carry a show with such a large ensemble by himself. This show, the second Broadway revival of the Pulitzer Prize-winning 1961 musical, is a full-scale, well-rounded production that looks great, sounds great and is a whole lot of fun. This is a broadly satirical tale of a young window-washer, J. Pierrepont Finch (Radcliffe), who takes the advice of a book (narrated by CNN’s Anderson Cooper) in how to rise to the upper levels of management at the World Wide Wicket Corporation. Along the way, he meets Rosemary (Rose Hemingway), a young secretary with lofty goals of her own, as well as the boss’s nephew Bud Frump (Christopher J. Hanke) who becomes his professional nemesis, and a varied host of secretaries, office workers and corporate executives. . The boss, J.B. Biggley, is played with a kind of goofy charm by the show’s other well-known star, John Larroquette (best known from the classic sitcom Night Court), and his scenes with Radcliffe are a delight. The tone of this piece is satire, with many jabs at corporate culture that are still relevant today, but also with a very palpable 60s vibe provided by the excellent costumes and sets. The performances are universally appealing. 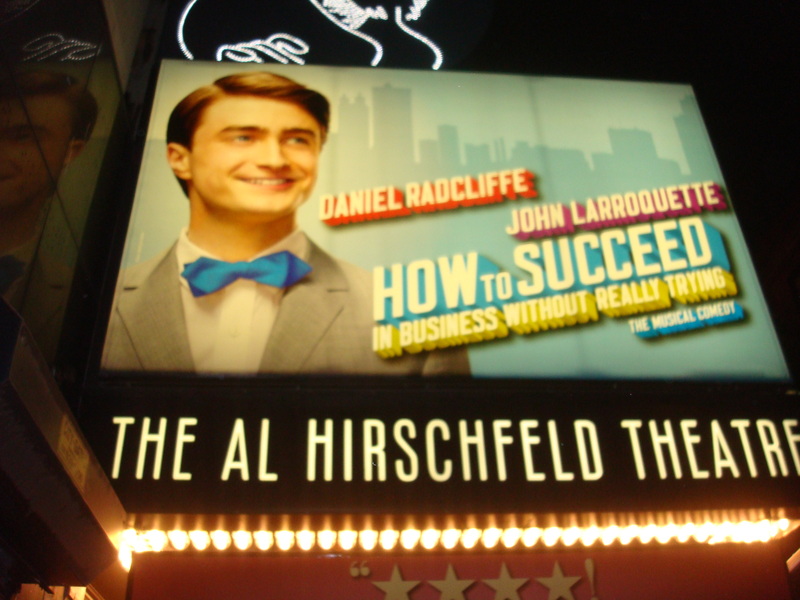 The role of Finch demands an actor with loads of (seemingly) guileless charm, and Radcliffe delivers. He does at times seem a little subdued in his acting, in contrast to the broadly comic tone of the show, but for the most part he is excellent, and his dancing skills are surprisingly adept. Hemingway is perfectly cast as the secretary who pursues Finch romantically, and their chemistry together is sweet and believable. Other stand-outs in the cast are Tammy Blanchard as ditzy bombshell secretary Hedy La Rue, with a look reminiscent of Joan from Mad Men and a voice reminiscent of Slappy Squirrel from Animaniacs, and the aforementioned Laroquette, who seems to be having an absolute ball in this part and owns the stage whenever he’s on. Hanke as Frump makes for a effective bumbling “heel”, and Mary Faber as Rosemary’s secretary friend Smitty and Ellen Harvey as Biggley’s secretary Miss Jones put in fine comic performances as well. This is a dance-heavy show where the leads and the ensemble get quite a workout—there are dancing mail workers (“Company Way”), dancing secretaries (“Cinderella Darling”), dancing football players (“Grand Old Ivy”), dancing executives (“Brotherhood of Man”) and even dancing pirates (“Pirate Dance”), and all of the dancing is full of seemingly effortless energy. “Brotherhood of Man” in particular stopped the show with its gradually building, stage-filling controlled chaos. Radcliffe more than holds his own in this department, as does the fine ensemble. I must also make special mention of the spectacular set. Done in a colorful mid-century modern style with geometric patterns, shelves that slide out from the sides to serve as offices, and modules that are rearranged into various configurations as needed to suggest the corporate environment, the set serves very well to set the tone and mood of this production. The color-shifting hexagon background reminds me of a 60s game show, and there’s an authentic-looking, functional elevator as well. Kudos to set designer Derek McLane for his excellent work here. Overall, I had a great time at this show. It’s much more than just Harry Potter on stage (in fact, it isn’t that at all). It is a thoroughly entertaining, well-directed and choreographed satire of the business world, winningly performed by an appealing cast. I highly recommend checking it out. This is the Tony Award-winning revival of the classic Cole Porter show, normally starring Sutton Foster and Joel Grey. At the performance I saw, however, the understudies were on–Tari Kelly for Foster as Reno Sweeney, and Robert Creighton for Grey as Moonface Martin. I could hear some not-so-subtle grumbling from some audience members at the fact that the marquee names were not performing, but by the end of the first act most such complaints were silenced, as both Kelly and Creighton gave wonderful, star-worthy performances. This is a show about the music, really. It’s Cole Porter hit after Cole Porter hit, with a somewhat silly but still very entertaining plot to string the songs together. Most of the action takes place on an ocean liner in the 1930s, where nightclub singer Reno Sweeney performs her church-inspired act and multiple subplots ensue involving her friends Billy Crocker (Colin Donnell), a stockbroker who is in love with a debutante (Erin Mackey), and Moonface Martin, a small-time gangster who is on the run from the law. There is much energetic singing and dancing along the way, all expertly done by the excellent ensemble. Kelly and Creighton were really the heart of the production, with stage presence and energy galore. Kelly commanded the stage with numbers like “Anything Goes” and “Blow, Gabriel, Blow”, singing and dancing up a storm, and Creighton was delightful as Moonface, especially in his Act 2 number “Be Like the Bluebird”. He did a wonderful job playing the “gangster with a heart of gold” with all the necessary charm and just the right hint of menace that made him believable as a gangster. Also excellent were Donnell as the handsome, lovestruck Crocker and Mackey as his love interest Hope Harcourt, and the two had excellent chemistry and danced very well together in “It’s De-Lovely”. John McMartin as Billy’s boss, the goofy old business tycoon Eli Whitney and Kelly Bishop as Hope’s mother, socialite Evangeline Harcourt provided some fun comic moments, and Adam Godley as Hope’s eccentric English fiancé Lord Evelyn Oakleigh was a sheer delight as well, putting a whole lot of energy into his number with Reno, “The Gypsy In Me”. The dance numbers in this show were a real highlight, with energetic, tightly-executed routines, and the set (again by Derek McLane) was fun, as well. The ship was constructed of various modules that could be rearranged and turned around to form the various set pieces, including the staterooms. The meticulously detailed costumes by Martin Paklidinaz added to the 30s-era feel of the show as well. Overall, I felt transported to the 1930s and had a great time joining the cast and crew on their voyage. The moral of this story is, don’t be too disappointed when you see a show and find out the understudies are on. You just might be pleasantly surprised, as I definitely was here. 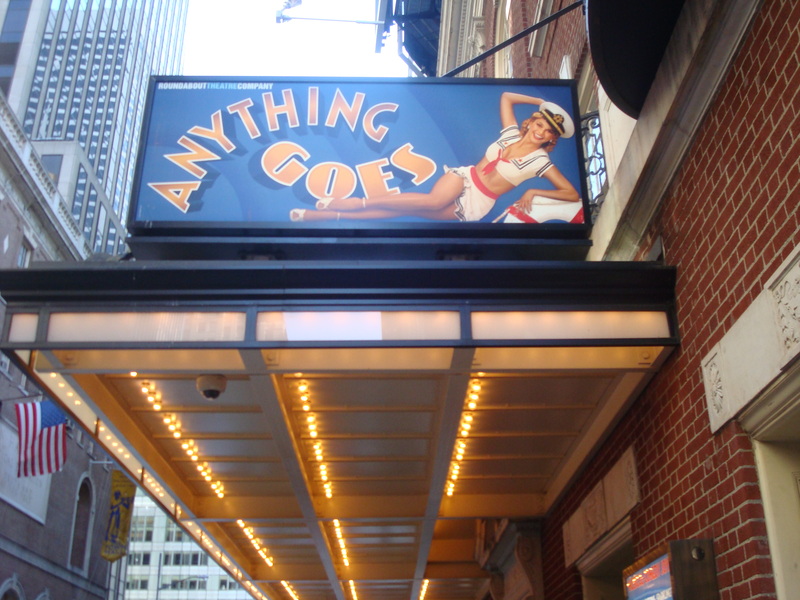 Anything Goes was a complete joy of a show, and the understudy/leads more than held their own. I would love to get a chance to see the regular players and compare, but as that option is unlikely, I will just be happy with what I did get, which was a wonderful performance from all.